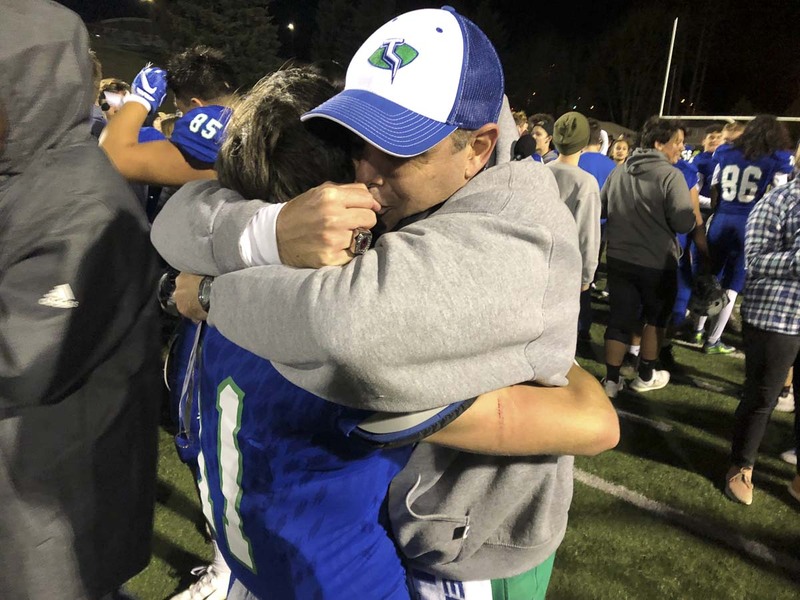 VANCOUVER — The Mountain View Thunder answered every challenge Saturday night, and there were so many of them. The Rainier Beach Vikings had six consecutive possessions with a chance to take the lead. The Mountain View defense stopped them six consecutive times. A one-point game at halftime remained a one-point game the rest of the way, and now Mountain View is one win away from the championship game. Mountain View took down Rainier Beach 7-6 at McKenzie Stadium in a Class 3A state football quarterfinal matchup and will travel to Seattle to face O’Dea next week in the semifinals. “Our defense was just crazy today,” said Michael Bolds, who had his team-record eighth interception of the season. He also blocked the extra point that turned out to be the difference maker. The Thunder are crazy for this time in their lives. That is what this team was playing for, he said, for all the Thunder. It took all the Thunder to get this victory. Remlinger, displaying tears of joy after the game, noted this squad’s depth chart. He got injured and had to leave the game. His replacement, Gage Rutherford, with very little experience, was on the field when Mountain View kept shutting down the Vikings. “This defense was so stingy,” Remlinger said. The Thunder opened this game like so many this season — with a touchdown. They went 54 yards on 11 plays. Jack Mertens capped the drive with a 3-yard touchdown run. No one figured that would be the team’s only score. The Vikings got on the board midway through the second quarter on a 30-yard pass from Trey Morris to Orin Patu. Bolds got past security to block the extra point. “I was excited and everything, but I never thought that would be the final score at the end of the game,” Bolds said. It was because both defenses did their jobs the rest of the evening. Bolds got an interception to end one Rainier Beach drive. Remlinger had one of the back-to-back sacks the Mountain View defense applied on the Vikings to end the first half. 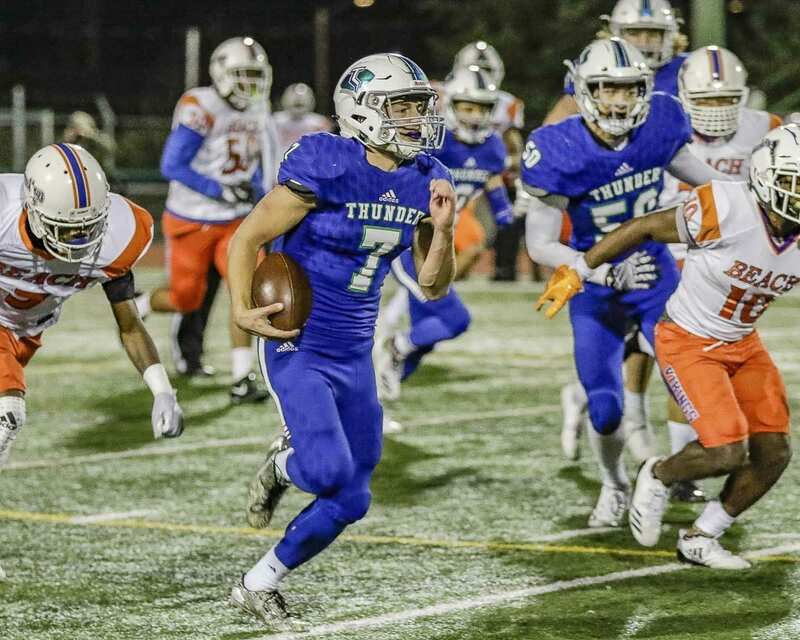 In the second half, Rainier Beach punted on its first three possessions, then lost the ball on downs on its final drive. Rainier Beach was held to 57 yards rushing. “We had little mistakes but we fixed them after every play,” linebacker Kobe Anderson said. Mountain View got the ball with 5:34 left in the game. And while the offense was not scoring in bunches this night, the offense secured the victory with its most impressive drive of the game. Garrett Moen, Jack Mertens, Tresean Foreman, and Phillip Earnhardt all carried the ball as the Thunder went 52 yards on 12 clock-killing plays. They went into Victory Formation for the 13th and final play of that drive. 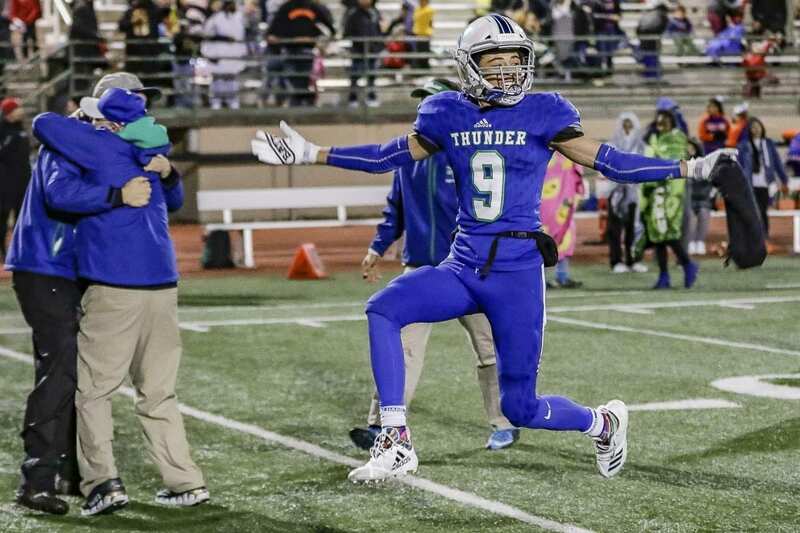 That set off a celebration at McKenzie Stadium as the Thunder improved to 11-1 — the most wins in program history — and clinched a berth to the semifinals for the first time since the team went to back-to-back semifinals in 2001 and 2002. That would be in reference to Mountain View coach Adam Mathieson, who is in his 11th season with the Thunder. This 11th season is the best one in school history, in terms of most wins. No Mountain View team has ever made it to the championship game. “It makes me so happy for Math, so happy for all us seniors,” Kobe Anderson said. RUSHING: Rainier Beach — Xzavier Burton 15-54, Morris 8-(minus 16), De’Monte Brooks 4-(minus 6), Ja’mezz Johnson 2-4, Xavier Bowen 2-21. Mountain View — Mertens 14-70, Garrett Moen 20-76, Tresean Foreman 4-22, Phillip Earnhardt 1-3, Team 1-(minus 2). PASSING: Rainier Beach — Morris 17-32-1-170. Mountain View — Moen 9-20-2-96. RECEIVING: Rainier Beach — Bowen 3-29, Patu 5-68, Chaun Hollins Jr. 1-4,Jibril Abdulalim 2-21, Burton 1-3, Sammy King 2-16, Kobe Elleby 3-29. Mountain View — Michael Bolds 4-43, Earnhardt 2-11, Makai Anderson 2-43, Mertens 1-(minus 1).